I stink at baking because I don’t measure precisely. However, I’ve actually made Coconut Custard Pie, Vanilla Tapioca Pudding and Anna’s Raspberry Freezer Jam. 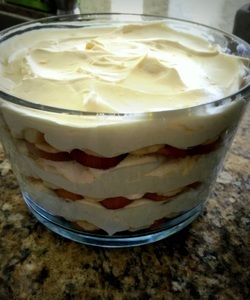 I find sweet-stuff recipes, but it is the husband who works the magic and deems it keep-worthy. He dreams of having a late-afternoon bakery for golfers (if the high-tech thing doesn’t work out). So if the 19th Hole Bakery ever opens, make sure you stop by!